Blurb: In the contest to keep their magic, the only options may be die… or kill. Well, I thoroughly enjoyed this. 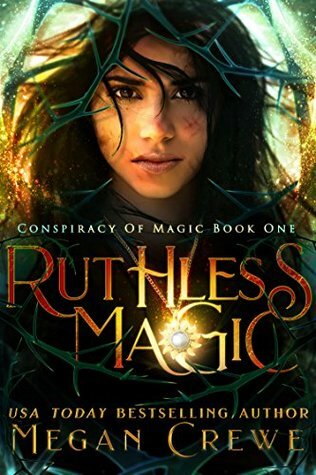 I’m honestly not sure what I expected from Ruthless Magic by Megan Crewe. I didn’t really know a lot about it, going in it. All I knew is that, while I loved the cover, I didn’t have super high expectations (why? That’s completely beyond me, honestly, especially since I had no bloody idea what the book was about) going into it, but I was still hopeful for a quality story. This reminded me so much of The Hunger Games or even The Maze Runner (which, admittedly, I haven’t read, but I did watch the film), and it was a refreshing change from the usual epic fantasy that I tend to read. We follow Finn and Rocío, both who have magically abilities, but are at risk of losing them and have to go through an “exam” and pass to become Champion, or else they lose their magic as the price. Or die. I loved both Finn and Rocío. I loved Rocío spirit and how desperately she wanted to prove herself and honor her brother’s memory, yet how important it was to her, as well, to keep her own identity and not be molded into someone else. She was prolly my favorite character, hands down. Finn was great, too. I love how soft he was and how he saw an injustice and decided to risk it all to fight it. As far as criticisms go, I don’t think I ever got a full grasp of what exactly the magic they wielded was and the rules governing it. Particularly at the beginning, I was a bit confused on what limitations they had and the role magic played in the grander scale of society and the world, and I don’t think that was ever fully cleared up for me, once I reached the end. I also thought the ending felt a tad bit rushed and wanted it fleshed out a little bit more. But, I still really enjoyed this book. The pacing was great (aside from the end), the voice pulled me in, in particular, and I thought the writing was solid. The story was interesting, the characters I cared about and overall, I just really enjoyed reading this book. It was a fun, easy read. I’ll definitely be checking out the sequel, and most likely other works by Crewe, as well! Super cool cover but not sure if makes me list to read. Sure enjoyed yer review of it though. An unofficial 8/10 is pretty good. Good review! I do love this cover! I’m surprised to see a successfully published author in this contest though! I thought it was for unpublished authors. I love this cover, as well! It’s for any self-published authors. I don’t do the vetting of that (especially since I was added late), so I just assumed she was self-published! This book sounds really good, and that’s such an amazing cover! It was really good, I really enjoyed it! I am definitely excited to check out the sequel. I own one or two of Crewe’s other books, but I haven’t gotten around to reading them. This makes me want to pick them up again. And I totally agree with you about that cover—gorgeousness!! I am definitely curious to see what happens next in this series, for sure! I know, I could NOT get enough of this cover!! It was, I really enjoyed it!